Just when you thought you’d seen/heard of all the possible re-inventions of Shakespeare’s stories, along comes another interpretation to blow you away. The other day we got sent an advanced copy of “William Shakespeare’s Star Wars: Verily, A New Hope“. That’s right folks, the newest kid on the alternative Shakespeare block is an “officially licensed retelling” of Star Wars on Shakespeare-style language – right down to the iambic pentameter. Although on the surface the idea might seem a little out there, the writing is in a relatively easy to read style and Star Wars (perhaps unsurprisingly as a great work of fiction) has plenty of the elements of a Shakespeare play – strong characterization, wise knights, evil lords, captive princesses…light sabers duels! “now is the summer of our happiness, made winter by this sudden, fierce attack!”. 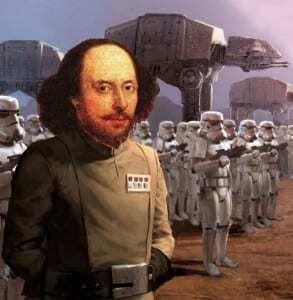 Perhaps not for everyone, but if you’re a Star Wars fan and you’re reading this Shakespeare blog, it might just be worth checking out. haha! 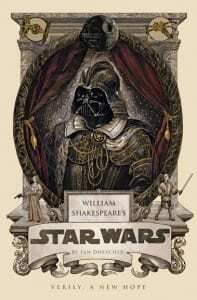 Your poster with Shakespeare head and Star Wars look awesome! Great blog, Greetings!